Brand: Open Door Press, Inc.
Ellie the Wienerdog is back! 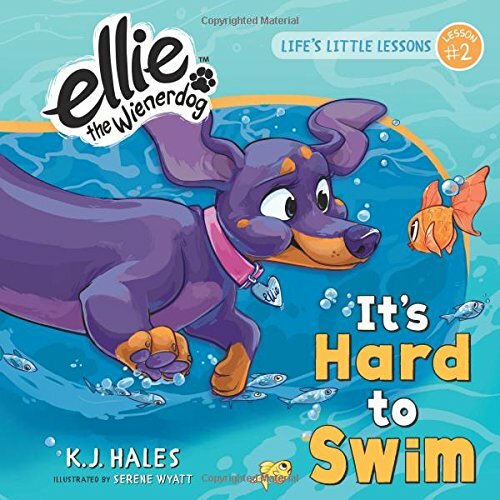 In Life's Little Lesson #2, It's Hard to Swim, readers are reunited with their favorite wiener dog as she is about to abruptly get her paws wet. Romping on dry ground and chasing a ball are the activities Ellie believes dogs are built to do. However, one day as she is enjoying her canine fun, she chases her ball onto a dock and then finds herself cornered by her ''people'' who think it would be a good idea for her to take a little dip. The drama builds as her mind goes into over drive imagining all the terrifying possibilities that could await her below the surface of the water. Will she sink? Will she end up as dinner for a hungry shark or a monster fish? Or will she overcome her fear and discover all the fun that comes with trying something new? Her future hangs at the end of a dock with very dark water below . . .
''Swim'' is a year-round Summer Fun read! Kids will love searching for all the hidden treasures in the vibrant, whimsical illustrations and grown-ups will love the timeless lesson that is shared through Ellie's humorous tale. The team of K.J. Hales and Serene Wyatt have done it again - thanks to the inspiration from Ellie the Wienerdog. Manufacturer: Open Door Press, Inc. Publisher: Open Door Press, Inc. Studio: Open Door Press, Inc. If you have any questions about this product by Open Door Press, Inc., contact us by completing and submitting the form below. If you are looking for a specif part number, please include it with your message.